There is much to consider when deciding to tackle a window drapery project. One of the most important factors is what type of drapery fabric to choose. Some of the things you need to think about are fabric weight, drape-ability, durability and privacy to name a few. Here are some tips that I hope will be helpful. Silk (or faux silk), most linen and velvet are superior for window drapery as they hang beautifully. Many other fabric styles have a good “hand” and will drape well, but just as many do not. To see if a fabric will drape well, take a nice size section of material and gather or pleat with your hand across the top. Does it fall into place along the folds or is it fighting back and flaring out? It won’t drape well on your window if it is too stiff and fighting the folds. Sheers are lightweight and can be used alone or layered under heavier draperies. They are great for filtering light. Sheers are a good choice if you are trying to bring in more outside light to an otherwise dark room. Linen is also a lighter-weight fabric that lets in light while still providing privacy. It also drapes very well. Muslin is a medium-weight fabric made of woven cotton. It breathes well, allowing airflow while still providing privacy. Lace fabric allows light to filter through, provides privacy and brings a classic look. Heavy, strong and tightly-woven fabrics like brocade are great for blocking light and for warmth. Velvet and tapestry are heavy fabrics that drape beautifully and provide a look of luxury. Heavy weight fabrics like velvet, suede, woolen weaves and tapestry will keep out the cold. If you don’t want heavy fabric on you windows but need to keep out the cold, consider a thermal lining on a medium-weight material. It will provide the necessary insulation. Layering fabrics like lace or laser cut designed material over a pretty color fabric can add texture and drama to your windows. Bathroom or smaller windows may only need a simple valance for decoration or a shade for privacy. If the window is the only source of light, choose sheer, light-filtering fabric. A simple valance that doesn’t intrude into the window works well if privacy is not an issue. If custom window treatment fabrics aren’t in your budget, look for higher-quality retail fabrics. There are many on-line discount sources for designer fabrics as well. Also, if you find a ready-made drape in a fabric you like, it is often less per yard even though it is a finished item. That is because it is produced in mass quantity. 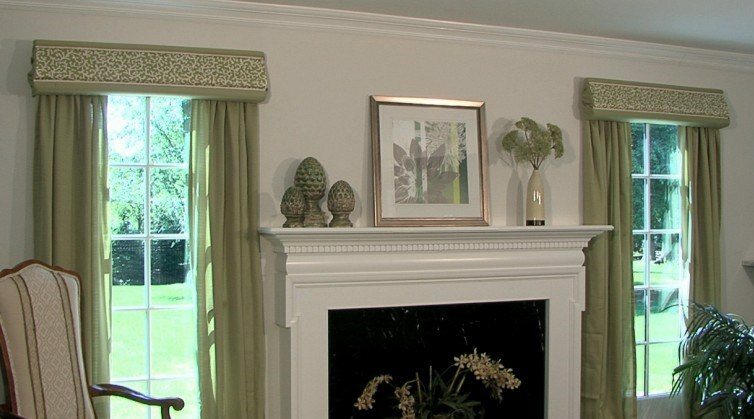 Fabric panels can usually be re-constructed into a custom style that suites your taste. If you want to add a sense of height and drama to your room, use longer length fabric panels and hang your drapery considerably higher than the window.